Hypotension, or low blood pressure, is a body condition where the blood pressure and the blood flow is lower. This state can cause fatigue, dizziness, fainting, nausea, unsteadiness and cold skin. You should not be concerned if you have lower blood pressure than what is considered normal at 120/80mm because active people with an ideal weight usually have low blood pressure. 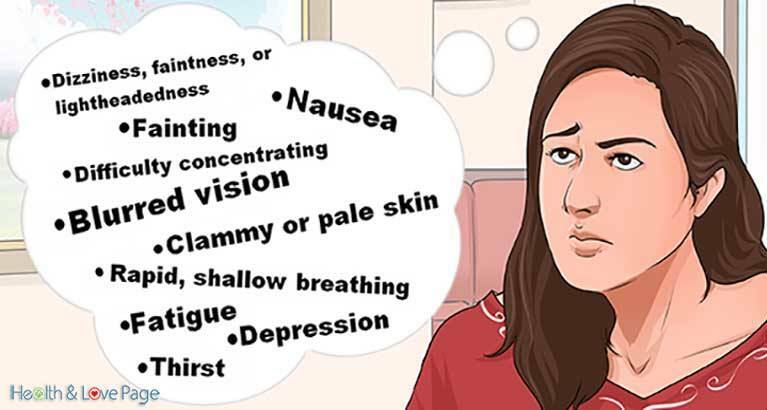 It is not unhealthy unless you have such symptoms. When you have a blood pressure reading which are consistent at 90/60mm Hg or lower, your body experience hypotension. In such case, when the blood pressure is very low, the blood flow is obstructed and there is not enough blood to the brain, heart or kidneys. The hypotension can be caused by several issues such as long bed rest, dehydration, lower blood volume, heart problems, hormone imbalance and pregnancy. Other causes may include certain medications such as alpha and beta blockers. antidepressants, diuretics and many others that can lower the blood pressure. When having a low blood pressure, it is usually suggested to take some fluid and salt intake. However, consult your doctor before you increase your salt intake. It is important to reduce the intake of alcoholic drinks and high-carbohydrate food including potatoes, pasta, rice, bread and many others. For this condition you can try some simple natural home food to increase the blood pressure level. 1. Salt Water. It is the sodium in salt that increases the blood pressure level, so you can try some salt water for that case. However, do not excess with its consumption because a greater amount tends to be unhealthy. Just mix one and a half of teaspoon of salt in a glass of water and drink it. 2. Coffee. When you think of something that will increase you blood pressure you will immediately think of a cup of coffee. Along with coffee, cola, hot chocolate of any other beverage containing caffeine can fight hypotension. When you experience hypotension on a daily basis, practice a cup of coffee in the morning but do not make it a habit since a long term usage can have some opposite effects. 3. Raisins. This is a traditional Ayurvedic solution that helps in the natural treatment of hypotension. You just need to soak 30-40 raisins in a glass of water and leave it overnight. In the morning, eat them on an empty stomach along with the water they were soaked in. Practice this treatment several weeks or even a month. Also you can consume, 4-5 almonds, 13-15 black currants and 15-20 peanuts with a glass of water. 4. Holy Basil. It abounds in vitamin C, potassium, magnesium and pantothenic acid. Its healing properties reduce stress and balance the mind. You need to extract the juice of around 15 basil leaves. Add some honey and drink the juice every morning on an empty stomach. You can also consume some basil leaves in the morning. 5. Licorice Root. This is a perfect solution to balance the blood pressure as a result of the low level of cortisol. It blocks the breaking down of cortisol and supports adrenal function. It is also useful in fighting fatigue. You can prepare a tea with one teaspoon of this herb and a boiling water. Leave in for few minutes and then drink it. You can combine a tea treatment with 400-500mg of licorice capsules. 6. Beetroot Juice. It is very beneficial for regulation of any type of pressure. If you have hypotension, drink a cup of beetroot juice twice a day for one week.